​This entry is going to be a little bit of a hybrid between negative and positive. I am going to highlight a problem that currently exists in the United States as a negative then shed some light on people that are trying to fix the problem. ​The issue I am looking at today came about in 2010 with a U.S. Supreme Court decision known as the Citizens United case. The case centered around a couple of political documentaries and whether they violated federal election laws. A federal law stated that neither corporations nor unions were allowed to use their money to fund any kind of “electioneering communications” within 30 days of a primary election or 60 days from a general election. As the 2004 Presidential election approached, Michael Moore’s film that criticized George W. Bush’s handling of the September 11th attacks called Fahrenheit 9/11 was beginning to be advertised on television. A group called Citizens United filed a complaint saying that the Fahrenheit 9/11 ads were essentially anti George W. Bush ads and should not be allowed to run since Bush was seeking reelection. The Federal Elections Commission dismissed the complaint. Citizens United then attempted to make their own films including one critical of Hillary Clinton called Hillary: The Movie that they planned to release and run ads for around 2008 when she was expected to seek election for president. 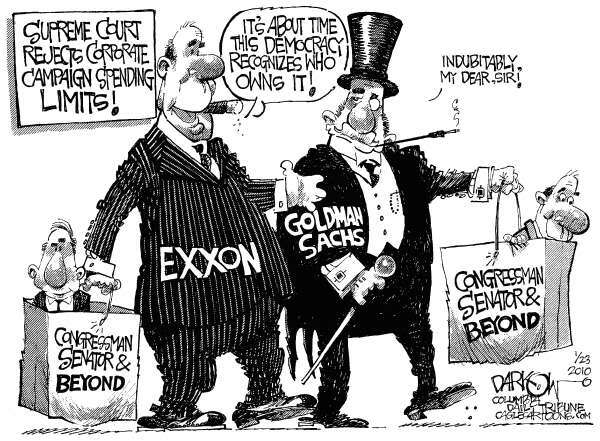 Their case eventually found itself in the U.S. Supreme Court where the justices voted in a 5-4 decision that it was unconstitutional for laws to limit corporations and unions from making election-related, independent expenditures. They also voted in a 8-1 decision that the disclaimer and disclosure requirements were constitutional. ​The majority opinion (the opinion of the five justices that voted together) on declaring corporate and union funding restrictions unconstitutional explained that they viewed these laws as a violation of the First Amendment. They claimed that if a corporation or group wanted to run ads in favor of or in opposition to a candidate, it should fall under freedom of speech. With this split decision the flood gates were now open. Essentially, corporations, unions, and any other group could now run as many of their own political ads that they wanted as long as they revealed which group created the ad. This is unfortunate because it will likely cause people to lose faith in our democratic process and lead to lower voter turnout. Our voting percentage is already pretty low, and anything we can do to keep it from lowering would be beneficial in my opinion. However, there is another negative effect of private groups being able to run their own election ads. Let’s say that I choose to run for the U.S. Senate and a corporation called Monsanto (corporation based out of St. Louis that creates many agriculture related products like Round Up) chooses to take an interest in my race and run ads against my opponent. 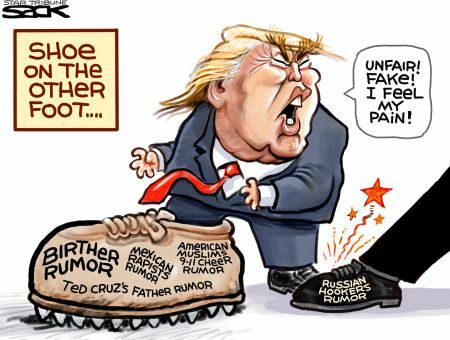 ​They could spend millions of dollars (they have plenty) to convince voters that I am great or my opponents are terrible. If I win, Monsanto is going to feel like I owe them a favor. After I am in the Senate, Monsanto may come to collect on that favor. There could be a new study showing that a key ingredient used in Round Up causes long term diseases and Congress proposes a bill to ban the ingredient. Monsanto doesn’t want to lose this ingredient, so they approach me and any other elected officials that they have helped saying that they will pull all of their support for our reelections and use it to help our opponents if we do not oppose this bill. Many of the elected officials may choose to go with Monsanto in order to keep their job instead of siding with the health of the people. Not me of course! Because my morals are too high, but that may mean that Monsanto causes me to lose the reelection and they have someone new to try and persuade in Congress. ​The above scenario creates a relationship of politicians that feel like they need to stay on good terms with wealthy corporations and other groups in order to stay in office. This relationship has definitely been seen before in U.S. politics. In the late 1800s up to the very early 1900s, many of the major cities in the U.S. were controlled by political machines and their bosses. The political machines were often powerful, wealthy men that would use their wealth and influence to get their own members or people loyal to them into government positions. It was then expected that they would get paid back in government favors. 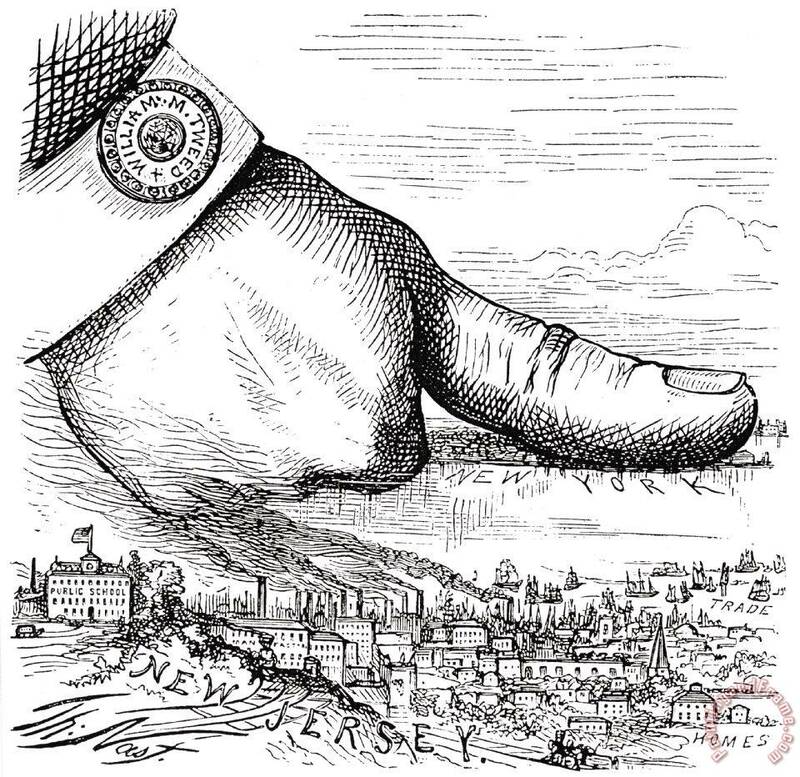 ​The most famous of these was a man named William Tweed (Boss Tweed) and his group called the Tweed Ring that controlled the New York City government in the later 19th century. Tweed and his ring would round up voters for the candidate(s) that they supported by targeting the poor citizens of the city and convincing them to vote the way the Tweed Ring wanted. Sometimes this was done through persuasion, but often it was just plain bribery. Knowing that the poor in New York were often desperate for money, the Tweed Ring would tell a person that there next month of rent would be waved if they voted for ___, or that they would get free food, or new cloths, or get to keep their job, or whatever they could do to convince them. The bosses were willing to make this investment because they knew that the return of having politicians that owed you favors would be well worth it. They even made sure that their candidate would only win by small margins so that the candidate firmly believed that they needed the political machine to win reelection. ​Once elected, the politicians were expected to repay the favor by helping pass legislation, helping “Tweed favorites” get appointed to key positions, hiring Tweed approved companies to do city projects, etc. An example of this would be when New York chose to build a new county court house. A member of the Tweed Ring had been appointed to head the Public Works Department. He chose to contract the court house job to a company within the political machine and pay them $13 million for the work. This is about $178 million today and several times more than what the job was worth. One person was paid over $100,000 for working just two days. The bosses and some members in government would then split the excess money from the job. I loved using the above political cartoon when teaching this in history class. It shows how New York City was "under Tweed's thumb", which not all of my students understood that saying. ​This meant that the cities tax dollars were being heavily overpaid to Tweed and his ring. They were able to continue this cycle for years as the Tweed Ring would use their influence and wealth to get people elected then turn around and cash in their favors for millions in government tax money. ​Political machines operated in many cities across the U.S. and had ties that reached all the way up to the federal government. The relationship that the Tweed Ring and other political machines were able to create with elected officials in the late 1800s is the same relationship that corporations could create with politicians today. Many corporations in multiple fields spent millions of dollars on elections in 2016. They didn’t do this for no reason. They are looking to get a payback somehow. Whether it be insurance companies looking to get a law allowing them to refuse coverage to people with preexisting conditions, fossil fuel industries hoping to avoid laws that help renewable energy, pharmaceutical companies wanting to keep cheaper, equivalent prescriptions out of the U.S., etc. They all made their investment looking to get something in return that will pay off. ​Most of these companies are currently trying to influence public voting through Political Action Committees (PACs) and Super PACs. 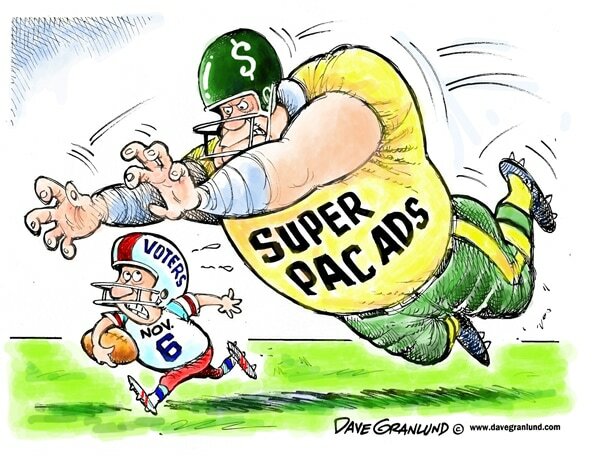 Regular PACs are organizations that attempt to raise and spend money to get a candidate elected or defeat others. PACs may only give up to $5,000 directly to a candidate per election and may only receive up to $5,000 from any individual. I like both of these Super PACs cartoons. The top one shows how easily regular people's voice can be crushed under the massive pressure of billions of dollars while the bottom one shows how Super PACs can be donated to and controlled by anyone and have any number of motivations. 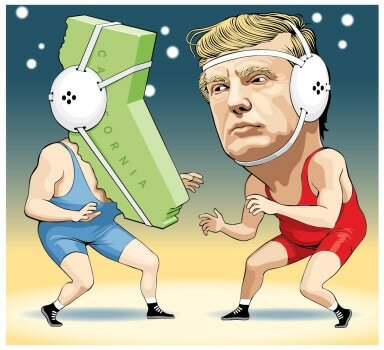 ​ A $5,000 limit is no where close to what some individuals and corporations are looking to invest though, so they normally use Super PACs. These are similar, but they are not allowed to donate directly to a candidate. Instead they must do the independent spending that the Citizens United decision allows. The upside for them is that they can spend as much as they wish and receive as much money as they wish from whomever they wish. These Super PACs often become the middle man between the big money from corporations helping get people elected and the politician themselves. However, there are many that are not satisfied with this status quo. 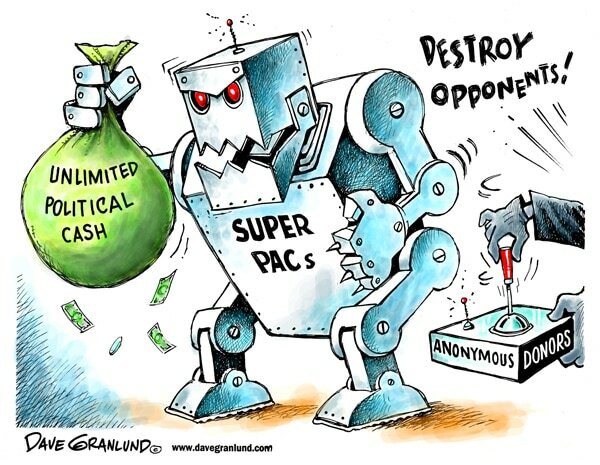 Some have suggested removing the regulation that Super PACs cannot contribute directly to candidates and/or the limit of only $5,000 per election. This means that people or corporations could contribute an unlimited amount to someone’s campaign. There would be little to no doubt that that politician owes a company favors then. ​On a brighter note though, I am certainly not the only person that has realized this downside to the Citizens United decision. There are people (regular people and politicians) that are trying to get the Supreme Court decision overturned. 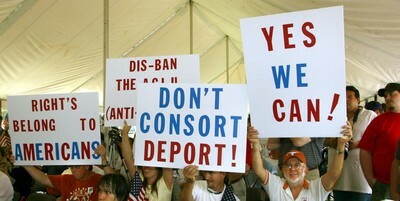 One downside is that overturning a Supreme Court decision has limited options. It can only be done by another Supreme Court decision or another Amendment to the U.S. Constitution. When Supreme Court justice Scalia died and his spot needed to be filled, whether the Citizens United decision could be overturned with a new member was a talked about issue in determining the next Supreme Court member. It is unclear where Neil Gorsuch will land on the whole issue. 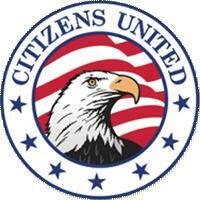 ​There are others that are attempting to get a 28th Amendment ratified in order to deal with Citizens United as well. I hope that one of these two routes ends up working out. 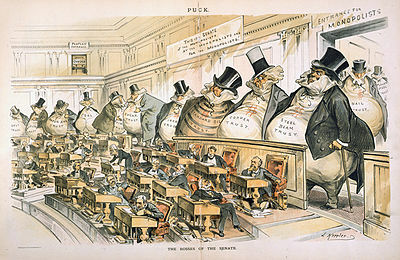 (Left) A political cartoon from the Gilded Age that shows huge business men standing behind legislators, indicating that they are the ones actually in control. 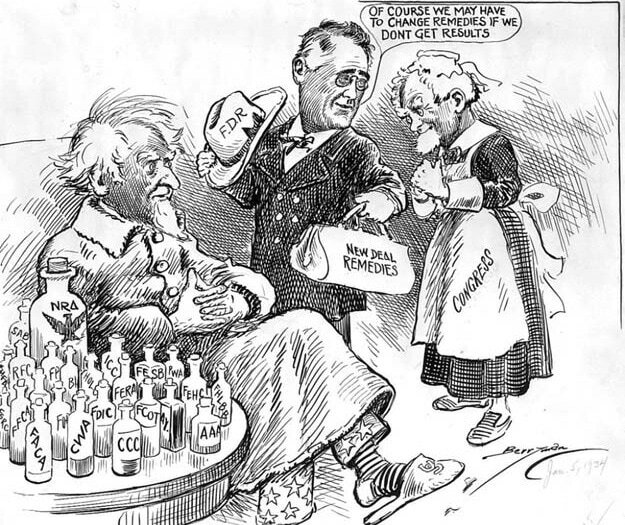 (Right) A political cartoon showing large corporations that have purchased Congressmen with the same moral behind the image as the Gilded Age cartoon. On a related side note, that time of Boss Tweed and the political machines in the U.S. is now known as the “Gilded Age.” It is a term coined by author Mark Twain because while there was economic growth in the U.S. at that time, much of the prosperity went to the upper classes while many lower classes stayed poor. The term gilded means covered with a thin layer of gold. The late 1800s in the U.S. looked great from the outside with many millionaires and new booming businesses, but many barely scraped by underneath that layer of gold. ​As always, please feel free to ask questions and comment whether they are in favor or opposed. Thank you! A while back I asked for suggestions about topics to do entries about. I was given some good ideas (one of which I already had in the works). Among them was Puerto Rico. This one seemed particularly intriguing to me because I only had a basic idea of Puerto Rico and knew that there was an important referendum vote coming up soon for the people there. So this is where I chose to begin. 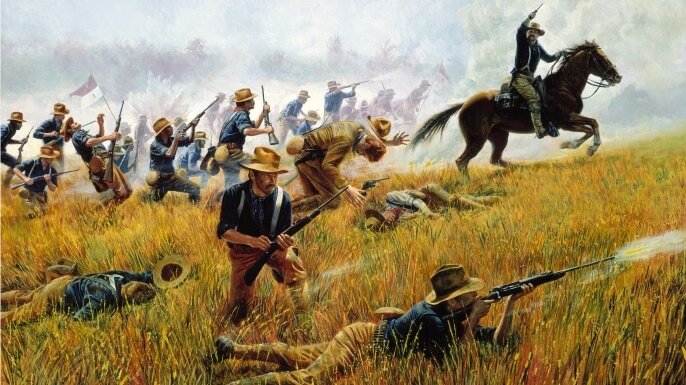 (Left) This is one of the more well known events of the Spanish-American War when Teddy Roosevelt and the Rough Riders attacked San Juan Hill in Cuba. (Right) The U.S. and Puerto Rican flags. Because of Puerto Rico’s somewhat remote location and the fact that it is a small island with few natural resources, it was hindered from developing a strong manufacturing base. However, the federal government did attempt to encourage companies to locate in Puerto Rico by giving corporate tax exemptions. 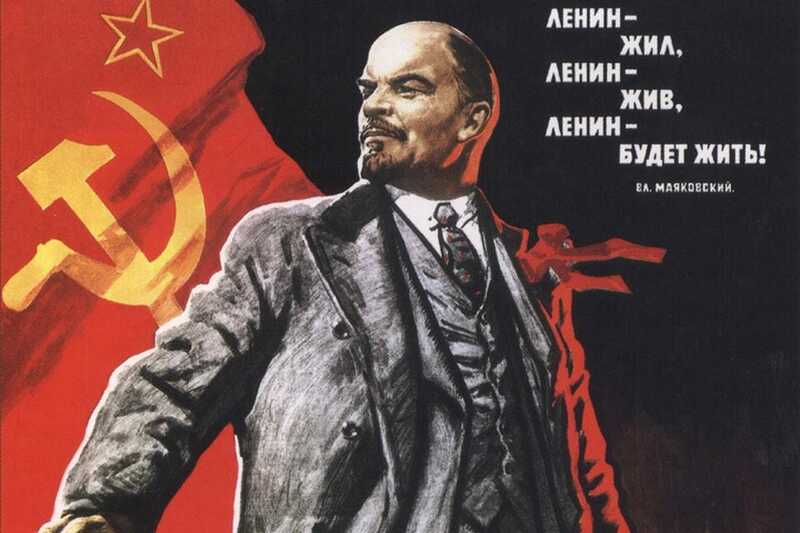 During the Cold War, the U.S. and other western countries demonized the Soviet Union and other communist countries for being imperialistic and undemocratic, but that seemed pretty hypocritical when the U.S. had territories like Puerto Rico, Guam, Samoa, and others. So the federal government re-branded places like Puerto Rico as “commonwealth.” The relationship did not really change, but I guess commonwealth sounds less imperialistic than territory. Puerto Rico and other commonwealth areas do have members in the U.S. Congress, but they are not allowed to vote on any laws. ​Now that we have a better idea of Puerto Rico’s relationship with the mainland U.S., I’ll move into how problems began to arise for Puerto Ricans and lead us up to today. ​Overall, Puerto Rico is a poorer area (like most U.S. territories). Their average per-capita income is about half that of Mississippi’s which is the lowest of the current states. More than 60% of their population receive government assistance like Medicaid, Medicare, or military benefits. But the territory does not receive anywhere near the amount of federal funding that states do. This leaves the Puerto Rican government having to figure out how to make up the rest of the funds. ​In the 1970s some of the Puerto Rican officials made the mistake of using government bonds to balance the budget. 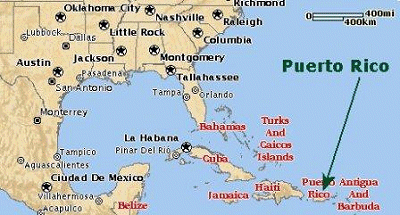 Bond holders from all 50 states jumped at the chance to buy Puerto Rican bonds. The bond holders assumed that these bonds were fool proof because there was no risk of the territory declaring bankruptcy since states were unable to do so. The bonds in Puerto Rico were also exempt from many of the taxes that state bonds were subject to, and (because of the Puerto Rico’s relationship with the U.S.) the territory was required to pay out to their creditors before anyone else. The bond holders assumed that no matter how crippled the Puerto Rican economy may become, their investments would be safe. This resulted in a rapid increase in Puerto Rico’s debt. It has risen to over $70 billion today. ​Furthermore, the corporate tax exemptions that the federal government had put in place to encourage companies to move to Puerto Rico were not permanent. As the exemptions were set to expire and companies were facing new taxes, they began to move away from Puerto Rico. One of the major companies that took advantage of the federal tax exemption was the pharmaceutical company Pfizer. They chose to leave Puerto Rico to avoid incoming taxes in 2006. 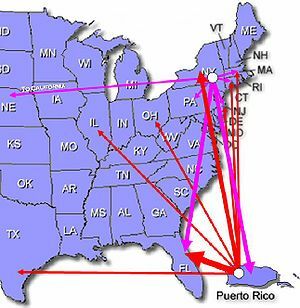 With this move, Puerto Rico lost a large percentage of their jobs and just a couple years later the U.S. entered the Great Recession. This caused a slowing of the economy across the states and commonwealth, but while the states were now struggling with the recession, Puerto Rico had been hit by a “one-two punch” from losing companies like Pfizer and the recession. By the end, Puerto Rico had lost over half of their manufacturing jobs. ​The weakened economy also triggered what many call the “Gran Migraciόn” or "Great Migration" in English. This was when many of Puerto Rico’s skilled workers began to move to the main United States for better financial opportunities. Between 2011 and 2013 the island lost an estimated 50,000 residents a year. In 2016 alone they lost an average of one doctor a day and had to close 10% of their schools because of losing teachers. All of this created a large loss of tax revenue and resources for the Puerto Rican government. ​The loss of companies like Pfizer, large selling of bonds, and the Gran Migraciόn all factored into Puerto Rico’s current position of having their debt worth about 70% of their total gross domestic product (GDP). By comparison, most state’s debt equals about 17% of their GDP. ​This weak economy has scared Puerto Rico’s creditors. Many of them have chosen to trigger “acceleration clauses” which make their principle and interest payments come much sooner. The Puerto Rican government was unable to make the original payments, they definitely will not be able to pay the accelerated costs. ​In 2012 the Puerto Rican government attempted to boost their economy by creating new taxes to boost government revenue while also attempting to use trickle down economics by giving large tax breaks to wealthy individuals. 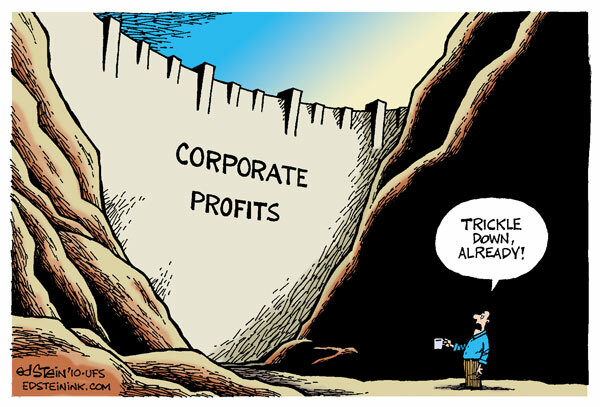 The theory of trickle down economics is that by giving tax breaks to the rich, they will have more money and be motivated to do things like start new businesses, expand businesses, or just buy more stuff. That would allow more people to be hired, who would then get more money, spend it, and so on. 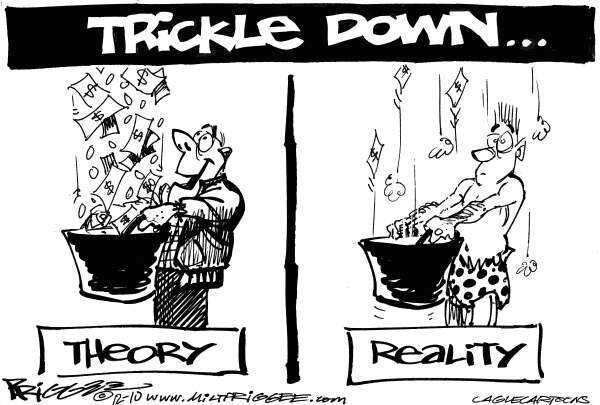 So eventually the money will "trickle down" from the top (wealthy class) to the bottom (middle and poorer classes). Supporters of the tax breaks said that it would attract investors and bring 55,000 new jobs to Puerto Rico. Later assessments revealed that only about 5,800 jobs were created and the tax breaks actually increased income inequality in Puerto Rico (which was already worse than any of the states according to the census data). This basically means that the rich got richer and the poor got poorer, which weakened their economy further. ​If this scenario happened to a U.S. state, they could file for something called Chapter 9 which is a type of bankruptcy that allows the state to restructure their loans, but commonwealth areas like Puerto Rico were specifically forbidden from using Chapter 9. If Puerto Rico was an independent country from the U.S., they could qualify for something called the International Monetary Fund that would essentially allow them to use a bailout from other countries to help keep up the global economy. But while Puerto Rico is still technically part of the U.S., this is not an option for them either. So, because of their current commonwealth status, Puerto Rico is in this strange middle ground that keeps them from getting many of the legal assistance options that are available to others. ​In 2016 Barrack Obama and members of Congress worked to find a solution to Puerto Rico’s predicament. The idea was called Promesa which would be a bankruptcy-like process that would allow Puerto Rico to restructure their debt (similar to what states have with Chapter 9). Promesa was fiercely resisted by the debt holders who lobbied for Congress to reject the idea, but it did manage to pass. Puerto Rico filed for Promesa bankruptcy in early May 2017 in federal court. 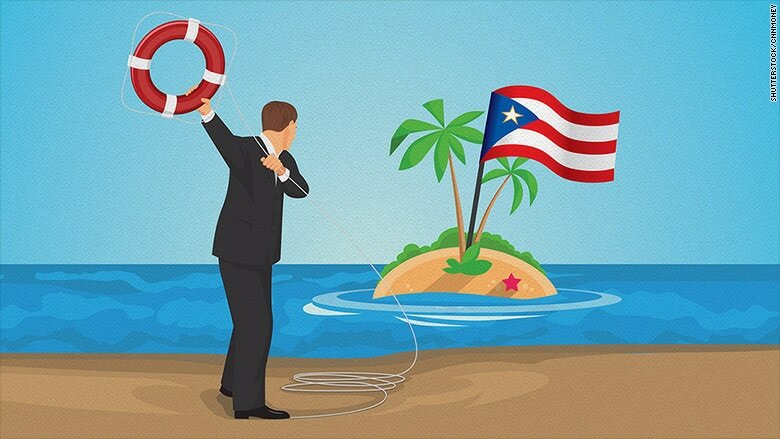 The above cartoon shows someone finally throwing Puerto Rico a "life saver"
​Promesa will likely help Puerto Rico for the time being, but they still sit in a strange limbo area of being a commonwealth of the U.S. Because of this, they could find themselves in trouble again. Puerto Rico has a referendum vote scheduled for June 11th, 2017. The people have three options to choose from; Statehood, Independence, or Current Territorial Status. The political status of Puerto Rico is heavily debated by the people that live there. Many prefer statehood, many prefer to stay in the commonwealth, and some would prefer to be independent. Most agree that becoming a state would likely be Puerto Rico’s best option for solving their financial issues, but others fear that full statehood will undermine Puerto Rican culture and make them too “Americanized” like the U.S. has done to cultures in the past. The Spanish language is a central point of the debate. Most people on the island can speak Spanish and English perfectly well, but some cities that support statehood removed all Spanish words from road signs as a means to help assimilate the island. The above picture is an easy visual of Americanization. Both images are the same boys. The left is them in traditional Lakota dress. 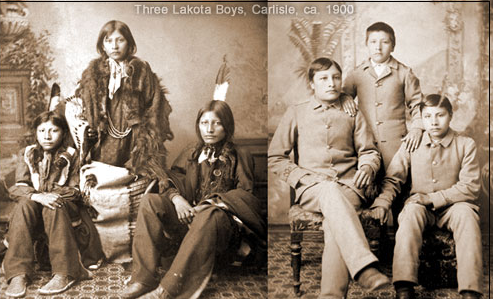 The right is them just a couple years later after being forced to go to a U.S. school designed to teach them how to be "American" and unteach them their Lakota heritage. ​If the people of Puerto Rico vote in favor of statehood on June 11th, it would still have to go through the U.S. Congress and adding a 51st state would have definite effects to the U.S. political system. Because of Puerto Rico’s current population, they would get five members to the House of Representatives and the standard two Senators to the Senate. These extra voting members could be critical to U.S. policy. This would also give Puerto Rico seven votes in the electoral college system that elects the president. 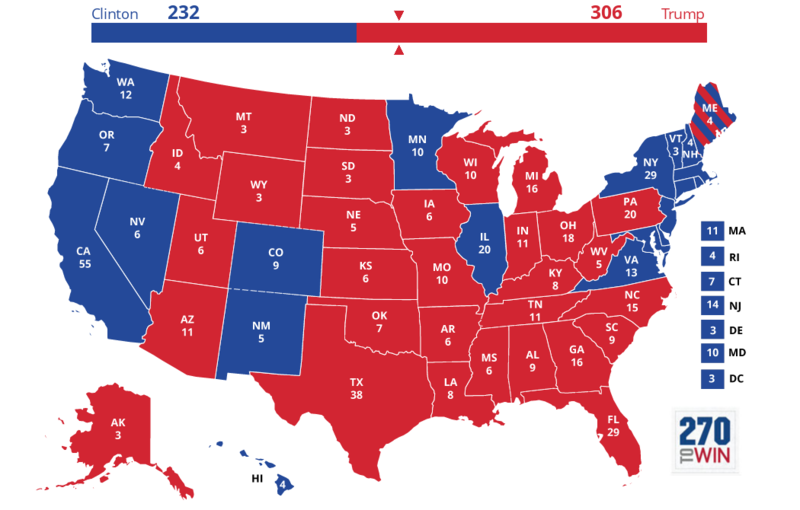 Since about 83% of Puerto Ricans living on the mainland U.S. voted for Barrack Obama in 2012, most will assume that that Puerto Rico as a state would likely elect more liberal members to Congress and give their seven electoral college votes to more liberal presidential candidates. With our current Congress controlled by Republicans, they may see making Puerto Rico a state as too big a risk for their political agenda and reject statehood for them. Or maybe they won’t. It is tough to be sure. 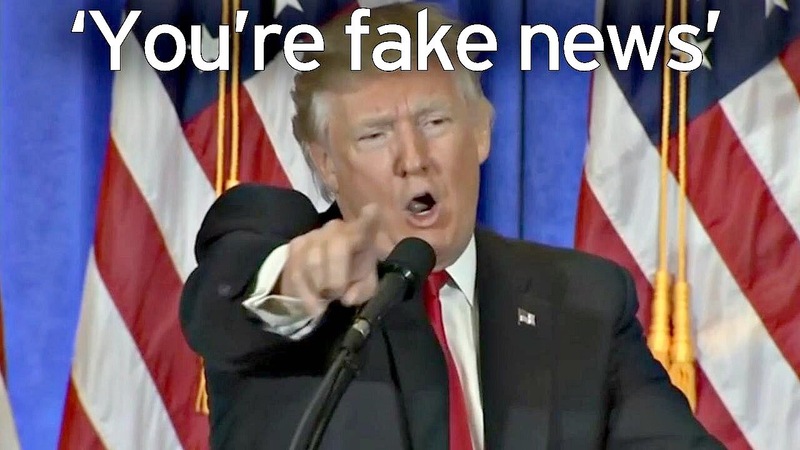 ​Either way, those are the facts about Puerto Rico, so now I’ll give my opinion. Keep in mind that I am not from Puerto Rico, so this is a very “outside looking in” perspective. I think that Puerto Rico’s best chance to get back to financial stability would be to become a state. Also, I believe that all citizens of the U.S. deserve to have a say in U.S. laws through voting representatives in Congress and election of the U.S. President. Staying in their commonwealth status may lead them to more financial troubles in the future too. I will admit that I cannot understand the fear of losing the Puerto Rican culture to Americanization as well as a person from Puerto Rico can, but I know that the mainland U.S. is already filled with many cultures and adding more of Puerto Rico would be nice. I hope that if Puerto Rico votes for statehood, the U.S. Congress will be able to look past political divides and strategy to honor one of the key principles of the U.S. Constitution: popular sovereignty. This means that people are the ultimate source of power in the government. 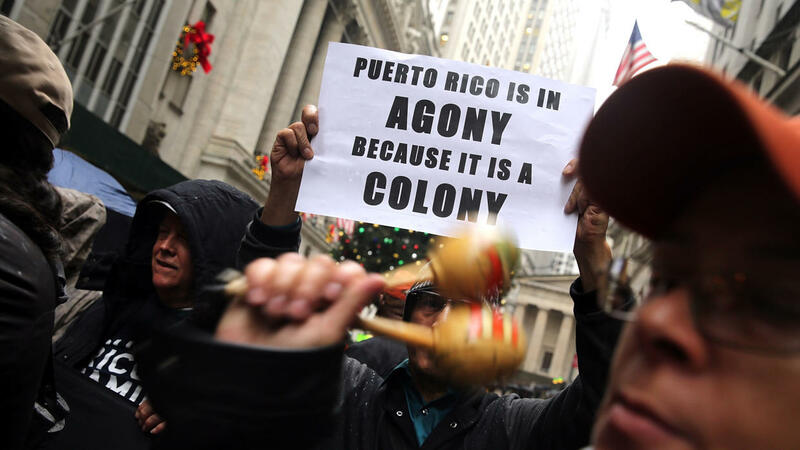 Denying Puerto Ricans statehood would be violating their popular sovereignty. ​As always, please comment and ask questions. I especially would like to get any opinions from people from Puerto Rico! Thank you for taking the time to read. ​I have done a couple of positive entries recently and I think those have been a nice change of pace, so I am going to try to highlight some more good things that people have been doing. Recently around the United States there has been increasing talk about the idea of having the government fund public college tuition for students. Tennessee, Oregon, and the city of San Francisco already have made most community colleges free for their residents and Rhode Island is considering making two years of a bachelor’s degree free, but the state of New York has recently decided to really go for it. 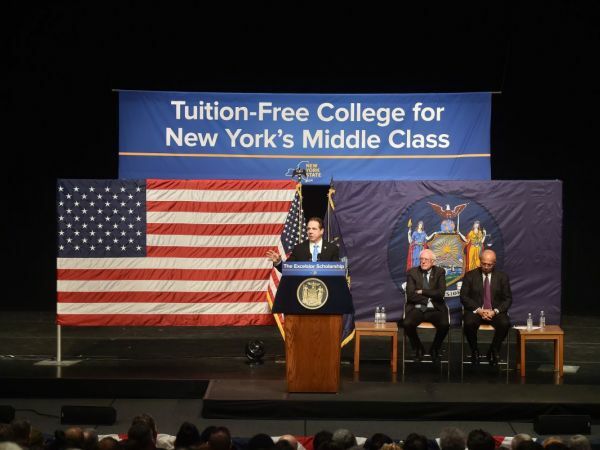 Their state government just chose to make four year state colleges free to many of the residents in the state of New York. ​New York’s program will begin in the Fall 2017 semester and be phased in over the next four years. To start off, any undergraduate students in NY whose families make $100,000 or less per year will be eligible for the Excelsior Scholarship which will cover tuition to any New York State universities or City of New York universities. That family income cap will increase to $110,000 in 2018 and end at $125,000 in 2019. ​Students will still be responsible for covering room and board if they live on campus, but it will save students an average of about $6,000 per year in college. ​There seem to be only a couple of requirements that the students must meet after being awarded the scholarship. They must take at least 30 credit hours per school year, but this number is said to be flexible to accommodate students that go to college part-time or must take semesters off. Graduating students that used the Excelsior Scholarship must also work in the state of New York after completing school for at least the same number of years that they received the state’s scholarship. ​Personally, I think that this is a great idea. I see this mentality as an investment in the future of our country and showing a value in education. Many children grow up with no person close to them that ever went to college, so they think it is just not something that happens for their family. 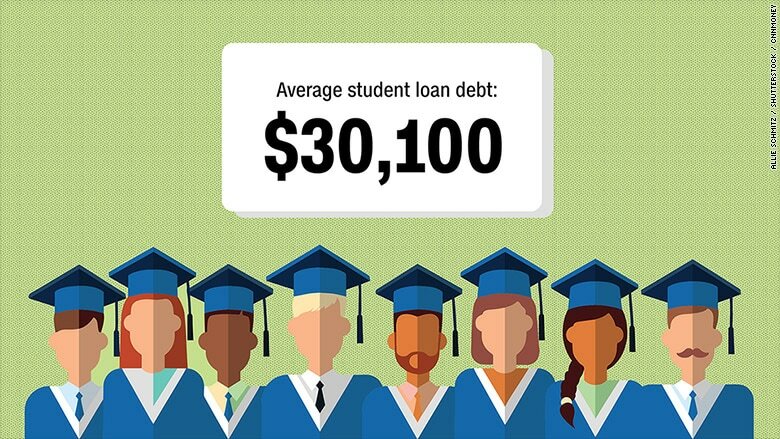 ​Yes, there are scholarships, grants, loans, and other programs out there to help people. However, many will not have the benefit of parents or other adults being there and ready to tell them about the different financial aid options available. This is not because they are bad parents or trying to hold their kids back. It may be because the adults do not know because they have never seen anything like it themselves. ​Others may be extreme victims of circumstance. Yes, everyone has probably seen movies or heard of someone that got a full ride scholarship because they worked hard and were athletic or intelligent. This option is incredibly minimal for students that grow up in an area that does not support their talents though. For example, if you go to a school in a town of less than 300 people, it is unlikely that many basketball scouts are going to see you play. If you’re a very gifted football player, but you move to a school who does not have a team or whose team is happy if they win one game a season, your chances of impressing talent scouts is also slim. If you are a brilliant history student, but your school does not receive the funding to attract AP (advanced placement) teachers, you are going to have a weaker transcript than those that did. The same can be said for art, computer science, sports, writing, etc. ​By creating a scholarship program like the one New York is implementing, the entire U.S. could send a message to all students that higher education is possible for them. ​Some people may see the benefit in this idea, but others may not. Giving kids more opportunities is actually not the only benefit to government-funded education though. There is a time tested, economic positive effect too. ​In 1944 the United States government chose to invest in the education of our country’s future while also thanking millions of soldiers for their service in World War II with the Servicemen’s Readjustment Act. Most people call it the G.I. Bill. This act promised government money to veterans for a range of expenses, including college. ​All of a sudden, millions of men who came from poor families that had never dreamed of being able to afford a college education had the ability to attend. Almost ten million men enrolled and obtained degrees to help propel them and their families into the middle and upper class. It is estimated that the money from the G.I. 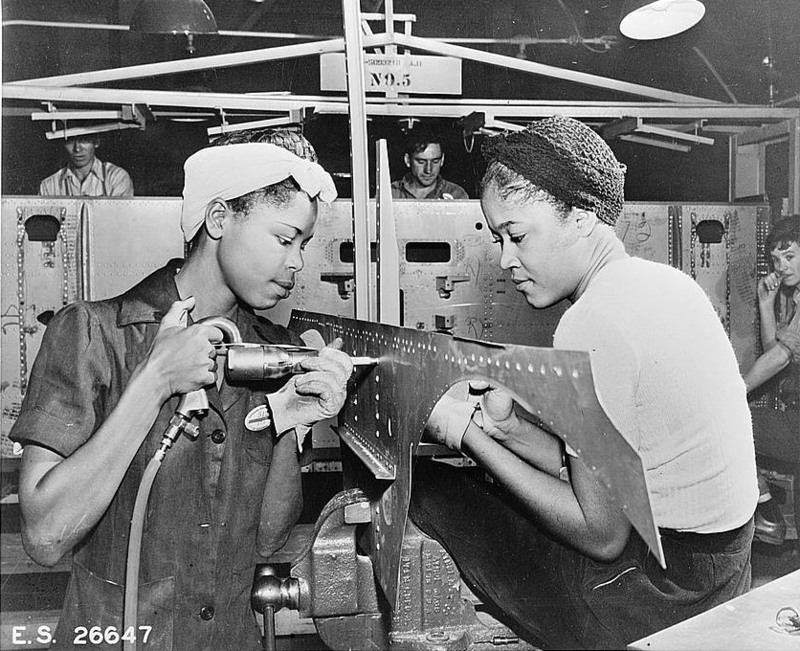 Bill for WWII veterans helped create almost half a million new engineers and hundreds of thousands of accountants, teachers, scientists, doctors, and other specialized workers. With higher educations and better paying careers, these former veterans could give their families a higher standard of living than they thought possible. With bigger paychecks, the middle class grew larger. The new middle class families were now able to spend their extra money on products, entertainment, and other luxuries. Some economists think that the increased incomes of these families were a large contributor to the economic boom that the U.S. saw following WWII. All of this would not have been possible for most of these people if the government had not chosen to invest in the education and future of their own people. ​In 1966 the government took the G.I. Bill a step further by expanding its benefits to peacetime veterans as well. Once again, many more people were able to attend college and obtain degrees that gave them a pathway to jobs that were not available to them without that extra education/training. About 50 years after the G.I. Bill had been introduced, Congress wanted to know how well it had worked out. Their report revealed that the U.S. government had spent over $38 billion in tax payer money for the higher education of veterans. However, they also concluded that having those more highly educated and higher trained citizens led to an increase of over $196 billion in U.S. economic output. They also found that the increased incomes of those families meant that the government had collected an extra $70 billion from income taxes. Overall, Congress concluded that for every $1 that they government had spent in sending people to college the U.S. got almost $7 back. This is strictly financial. It does not include aspects like our country being overall more educated, their children then choosing to pursue higher education, the advances in technology, medicine, transportation, military, and other fields that likely came from having a higher level of education in the U.S.
​I think it is safe to say that the G.I. Bill is one of the smartest and most beneficial investments that our government has ever made. The United States has the ability to make that kind of an investment again. Our legislators can look back at the risky decision made in history and learn from it. Because, lets’ face it, choosing to spend billions of dollars on something uncertain seems risky. But we have already seen this tactic work very well for our country. Other countries have already seen the benefit of this and implemented it. Countries like Finland, Denmark, Ireland, and Germany have already been sending their students to college for free. They have already chosen to make this investment in their country’s future. Also, many people in the U.S. are complaining about how our country has fallen behind many others in terms of education. Well, you’ll never guess some of the countries that outrank us (Finland, Denmark, Ireland, and Germany). ​Either way, our country could be missing out on a large amount of potential because there are smart kids slipping through the cracks. The person that could cure cancer may have been living in some small town in the middle of nowhere, believed that he/she will never have the chance to go to college, and never tried to get there. ​They will never be able to give their gift to the world without that higher education. The same can be said for the person that creates better solar panels, the next great military strategist, doctors, engineers, computer programmers, inventors , etc. ​I think we and the rest of the world deserve to see and benefit from what they have to offer. Plus, getting $7 back for every $1 we invest in them sounds pretty good too. My previous blog involved me fulfilling a challenge and I ended up writing a pro Trump entry because of something he has done since inauguration that I do agree with. Writing a positive post was a nice change of pace, so I thought I would give it another shot. This one has little to nothing to do with our current President, but it does involve what I think would be a good move for our country and it highlights some people that are attempting to move us in that direction. 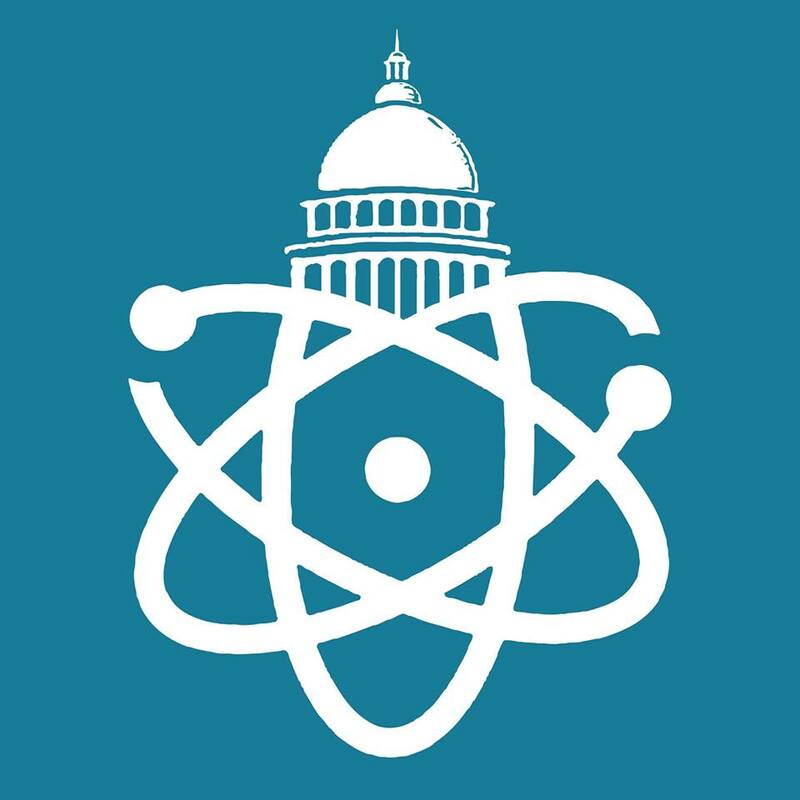 The Solutions Project is a group of scientists and other people that are doing their part to move the United States and rest of the world to switching from using fossil fuels like oil and coal for energy to renewable energy sources like solar, wind, and water power. 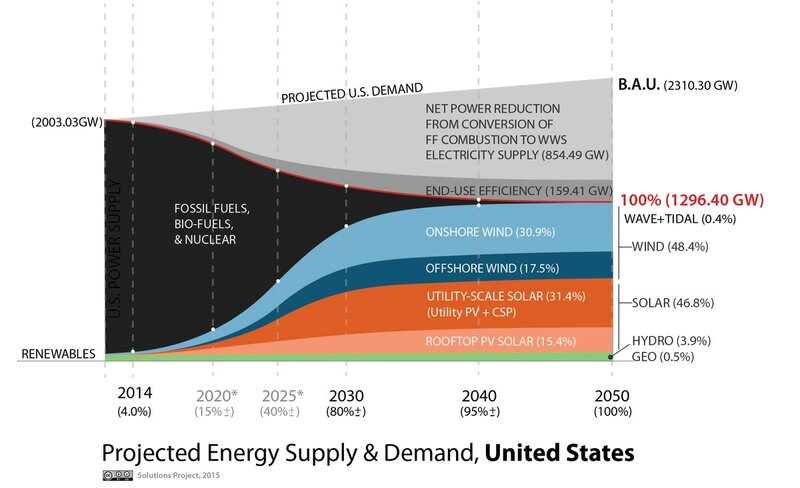 They project that the U.S. could convert 80% of its total energy consumption to renewable sources by the year 2030, and to 100% by the year 2050. These dates are under the assumption that we fully commit to the conversion and that better technology is not discovered that speeds up the process. Most likely some new discoveries like more effective solar panels, cheaper wind turbines, batteries with larger storage ability, or other possibilities could improve their guesses. However, this is what their research shows is currently possible. 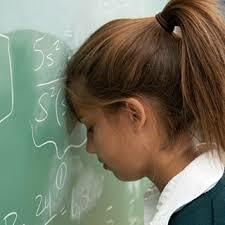 ​The Solutions Project has even gone as far as looking at each of the states individually. They have projected how much of each state’s total energy usage could come from the different forms of renewable energy based on their geography. I took a look at my home state of Missouri. It shows that 60% of our electricity could come from onshore wind. Anyone that has spent a year in Missouri probably looked at that statistic and immediately thought of just how much intense wind Missouri can get in the spring. It seems pretty likely that this is possible for our state. They also determined that this complete overhaul of Missouri’s energy system would have positive effects on the economy as well. This address will take you to their interactive map like the one in the image. Clicking on a state will bring up an infographic about their research in that area. ​It determined that it would take over 60,000 construction employees and over 23,000 operations employees to implement their plans just in the Show Me state. It could also save each person in Missouri about $368 per year on energy costs. ​The potential benefit of the energy overhaul proposed by The Solutions Project is very high, but I know that not everyone is completely sold on the environmental aspect of that, so I will set it aside and focus on an aspect that is more historically proven. ​Following the Black Tuesday stock market crash in 1929 and bank failures that followed, the United States slipped into the harshest economic period in our history. 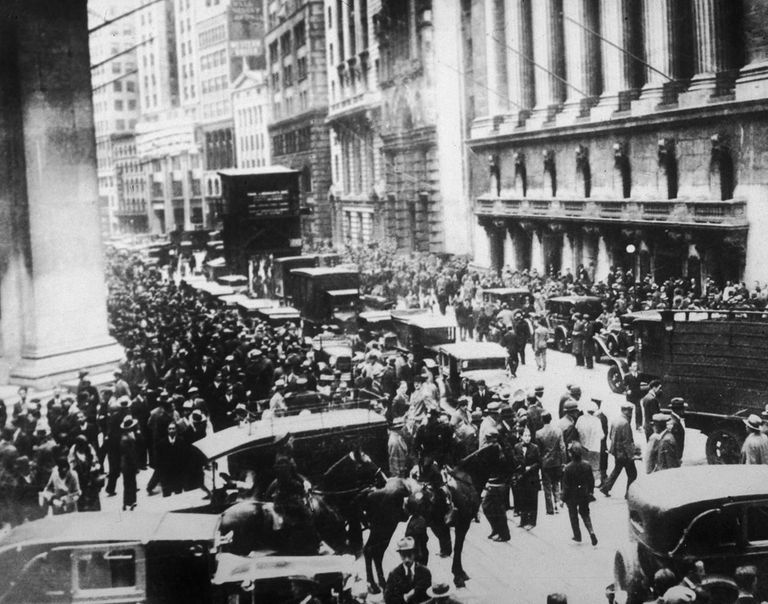 Today we call it the Great Depression. 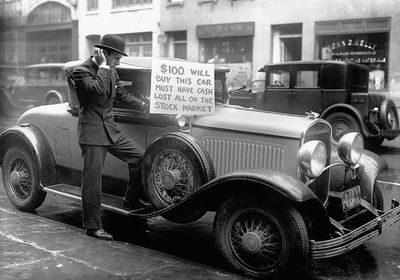 Some people lost everything in the stock market crash while more were hit hard by banks going out of business. For many people, their entire savings vanished overnight. This meant that average people did not have money to spare on non-essential items. Americans looked to replace President Herbert Hoover in the election of 1932 since he had been leading the country during the downturn. They overwhelmingly choose Franklin D. Roosevelt (FDR). FDR immediately turned his focus on addressing the Great Depression after being sworn into office. By 1933 the unemployment rate had reached 25%, and Roosevelt had multiple strategies to help relieve the people. Among his plans was to have the government hire people to work on new projects. 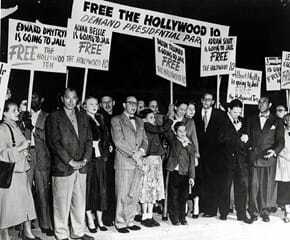 Many of these projects were collectively referred to as the New Deal. The idea was that if he could get people back to work and earning money, they could take that money and buy products from businesses. Those businesses could then hire employees to earn money. They could then spend their money at other businesses and get the circulation of money going again. ​Under the New Deal people were given government jobs building post offices, bridges, schools, highways, parks, and other public structures. The government also had people work on new, experimental programs. People were paid to build dams that could reduce flooding problems and provide hydroelectric power for people that lived in the region. Through this action people were being both protected and provided energy. Sound familiar? I like the above political cartoon of the New Deal. It shows FDR as a doctor that is attempting to "heal" Uncle Sam. The bottles on the table are labeled with many of the programs created to help get money flowing in the U.S. again. 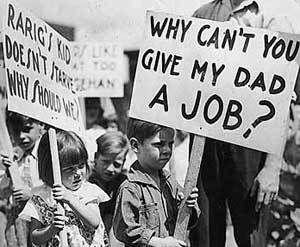 ​Now, the New Deal did not fix the Great Depression by any means, but it did provide some help. Historians generally agree that what really ended the depression in the U.S. was our entry into World War II. After the Japanese attack on Pearl Harbor the U.S. had to employ troops to fight against the Axis Powers and also employ people to build planes, guns, bullets, and other items to fight the enemy. 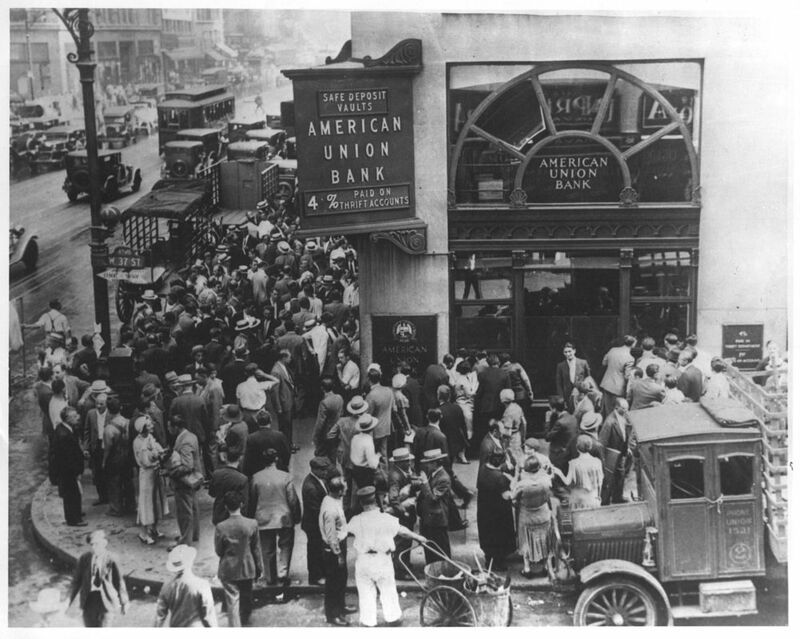 This meant that the government was now paying many people to help the war effort and it got a lot of money circulating around the country again. The above address will take you to the Government By The People site. I highly recommend taking a look at the petitions they are working with. A group in Missouri called Government By The People has been gearing up to gather signatures for multiple issues to help people living in Missouri. One of them is something called the “Green New Deal.” They have already seen the parallel between a complete overhaul of the energy system today and the New Deal of the Great Depression. ​I do not pretend that a huge shift in our energy system will be easy or that it will happen overnight, and honestly (from a jobs perspective) that is good. A commitment to make this shift over years means that there are manufacturers, installers, construction workers, and other people that will have guaranteed work for those years. ​I am going to steal something that I heard from someone. He said something along the lines of, “What if we do completely switch to renewable energy sources then we find out years down the road that climate change is completely wrong? Well then I guess we just made our world better for nothing.” I mean really we will have put thousands of people to work and gotten away from fossil fuels at least. The fact is that there is only so much of an amount of fossil fuels on our planet, and they will eventually run out. Sooner or later our world will need to find something else. Better sooner rather than later. ​Since Donald Trump was sworn in he has signed quite a few executive orders that I have not agreed with, but there is one that I was glad to hear about. When Trump took office the U.S. was currently in negotiations to enter the Trans Pacific Partnership (TPP) which would have created an agreement to lower tariffs and make trade easier between the participants like the U.S., Japan, Australia, Mexico, Vietnam, Canada, and more. I was happy to see that Trump signed an executive order to withdraw the U.S. from the TPP negotiations so that we would not join. The TPP agreement would have been similar to another trade agreement that the U.S. already has with Canada and Mexico called the North American Free Trade Agreement (NAFTA). 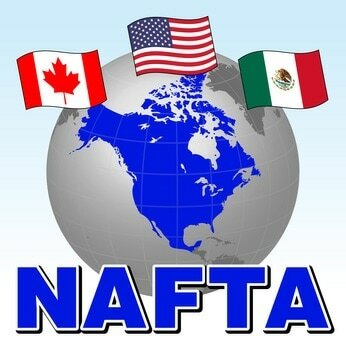 When NAFTA was implemented in the 1990s, the theory for many in the U.S. was that this would allow American companies to sell their products in Mexico and Canada cheaper than before since they would no longer have such restrictive tariffs while moving goods over national lines. It was believed that these larger markets in Mexico and Canada would force U.S. manufacturers to expand to meet the demand and therefore need to hire more employees. Some predicted that NAFTA could increase the U.S. job market by up to 30%. With the hype and projections of NAFTA fresh in everyone’s minds, the U.S. also sought a less restrictive trade agreement with another largely populated country; China. 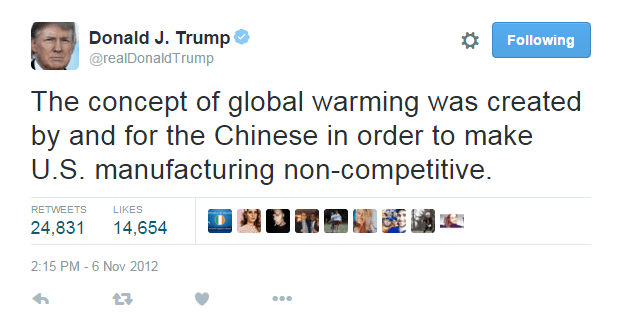 They thought that China’s massive markets would cause a major boom for the U.S. economy and manufacturing. The two countries worked out Permanent Normal Trade Relations (PNTR) in the early 2000s as major companies like Wal-Mart, Apple, Dell, and more advocated for the trade deal. These companies realized that there was another advantage for them if the U.S. worked out these trade agreements. A company like Ford could close a factory they had in U.S. and open one in China or Mexico to make larger profits. This is because a factory in the U.S. would require them to pay their employees a minimum wage, limit the number of hours that employees can work per week, provide worker’s safety precautions, and follow pollution regulations, among other regulations that all cost the company extra money. In Mexico and China, there are far fewer regulations to protect workers’ rights and the environment, so the factory can operate at a far cheaper cost. Without the NAFTA and PNTR trade deals, cars made in China and Mexico being shipped to the U.S. for sale would have charged Ford a tariff and forced Ford to increase the price of their cars being sold in the U.S. 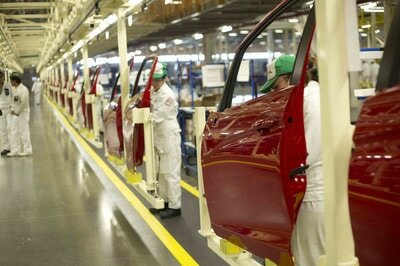 However, NAFTA and PNTR allow them to bring cars to the U.S. with little to no issue. 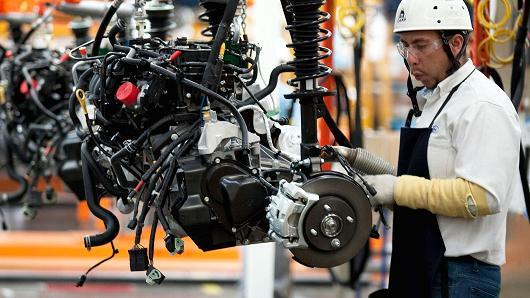 This means that Ford and other corporations could keep their products cheaper and see much larger profits by moving factories abroad then selling products in the states. Any companies that attempted to stay loyal to their American workers would quickly face a choice to either move their factories abroad as well or be driven out of business by competing companies that had already moved because they could offer their products at lower prices. 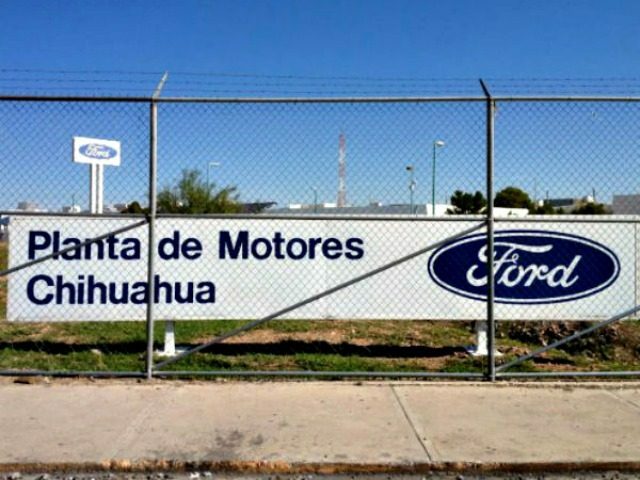 For example, let’s say that Ford has already moved their factories to Mexico while GM chose to remain in the U.S.. GM will need to pay its factory workers at least $7.25/hour which is the minimum wage in the U.S. while Ford can pay their employees Mexico’s minimum wage (about $4/hour). This means that it could cost Ford nearly half as much to produce a vehicle as GM, and Ford could then charge customers significantly less. Many consumers will likely choose the cheaper Ford option instead of GM, and GM will soon face the choice of staying in the U.S. and losing the market to Ford or moving abroad as well in order to compete. The minimum wage is just one difference in government policy that would affect the bottom line of companies. Pollution regulations, worker safety precautions, and others are all things that would up the price a little bit more to manufacture products in the U.S. instead of China, Mexico, or some other location. 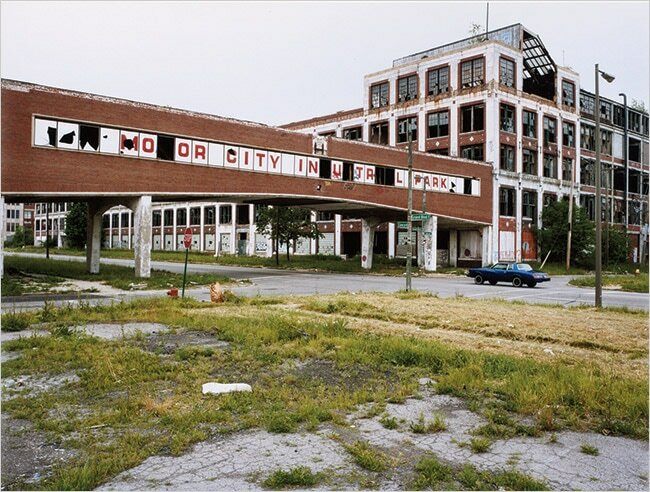 At one point Detroit was one of the richest cities in the U.S. because of the auto industry, but it has now become one of the poorest due to factory after factory moving to Mexico to take advantage of NAFTA. Just before NAFTA was implemented, the U.S. traded about $1.6 billion more worth of products to Mexico than it received. In 2015, the U.S. imported about $60 billion more than it exported to Mexico. This is because of the mass number of factories that have exited the U.S. in search of greater profits and these trade deals allow the companies to get away with this practice. ​The intent of the NAFTA and PNTR China agreements were to open up more markets to U.S. companies, but instead they have allowed companies to take advantage of the workers and labor laws in other countries and drain manufacturing jobs away from the U.S.. It is likely that the TPP agreement would have had the same effect with other countries. The best practice for the U.S. regarding trade agreements would be to only enter them with countries that have comparable labor and environmental protection laws. This would put the U.S. on a more level playing field for factories to produce products here while simultaneously encouraging better business practices around the world. I'll give a quick example. 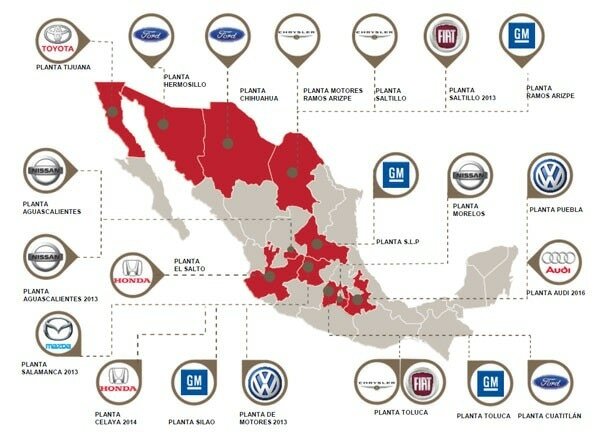 If the U.S. suddenly dropped its trade agreement with Mexico, it would force the companies and Mexico to make some serious decisions. The company could choose to move their factories back to the U.S. or another country that we do have a trade agreement with, or they could choose to keep their factories in Mexico but hurt their markets in the U.S. because of the new tariffs that they would have to pay to ship products into the states. Mexico would also face a difficult decision. They could either keep their current labor and environmental laws and allow factory jobs to leave, or they could update their laws and attempt to get a new trade agreement with the U.S.. All of these scenarios would end up better for the U.S. because they will bring back some factory jobs and give local products an advantage over foreign factories, and they will promote better labor and environmental laws around the globe. Overall, I will give Donald Trump props for getting the U.S. away from the TPP agreement and possibility of making our trade policies worse. It is nice to see that some facts from the past have managed to influence good decisions. Hopefully that repeats itself. ​I am not sure if I fully met the challenge because the ideas I suggested and supported are actually pretty progressive, but at least I wasn’t bashing on new policies this time I guess. In recent weeks Donald Trump has made what could be the most critical decision that he will have while in office. Many probably know at this point that I am talking about the United States’ attack in Syria. People have already been heavily speculating on what this action could mean for the U.S., but I am going to go through a quick run through of the situation and my thoughts on it anyway. 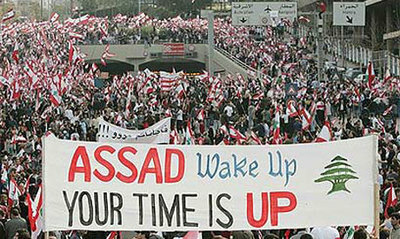 ​The civil war in Syria began in 2011 when the country’s leader, Bashar al-Assad, chose to have his military fire on a group of Syrians doing peaceful protest demonstrations. 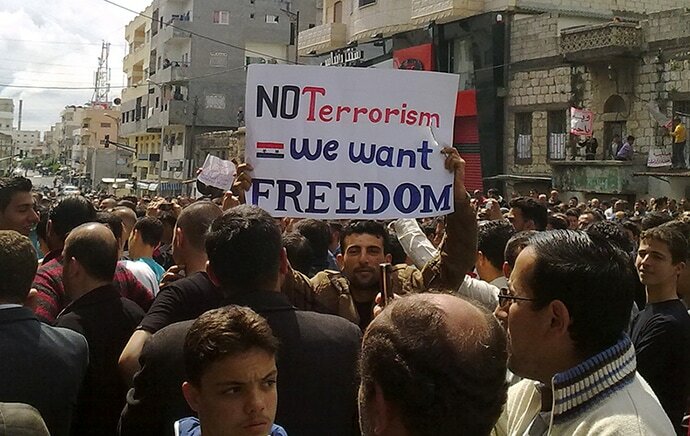 The protesters soon began to fight back against the Syrian military and some members of the Syrian army even left the country’s armed forces to join the rebellion. 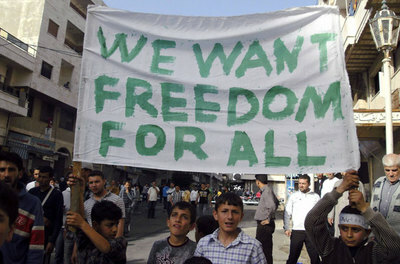 The group of rebels called themselves the Free Syrian Army. The country was soon in a civil war as the rebels fought against Assad and his remaining military. Islamic extremists began to join the rebels in fighting against Assad. Around the same time, Kurdish people living in Syria began fighting Assad for independence as well, but separately from the Free Syrian Army. Some of the rebels decided to break away and form their own group in Syria because of differences in opinion. The new group was affiliated with Al Qaeda and called themselves the Islamic State of Iraq and Syria (ISIS). The new group of extremists ended up mostly fighting against other rebel groups like the Free Syrian Army, Kurds, and other rebels instead of Assad. 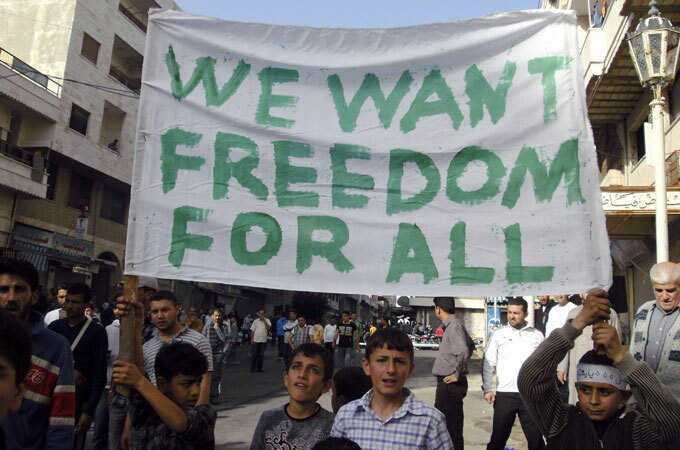 Outside countries have been influencing the different groups in the Syrian civil war as well. 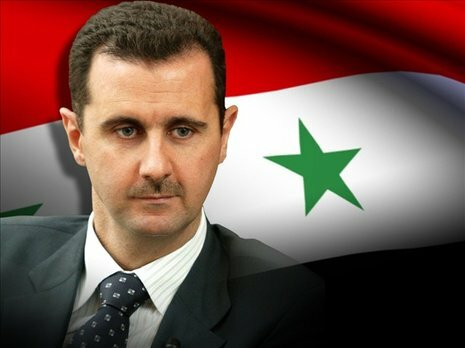 Assad has been supported by Iran and Russia. The rebel groups have been supported by countries like Turkey, Saudi Arabia, and the United States. Russia has used their military to help Assad by attacking rebel groups that fought against him. 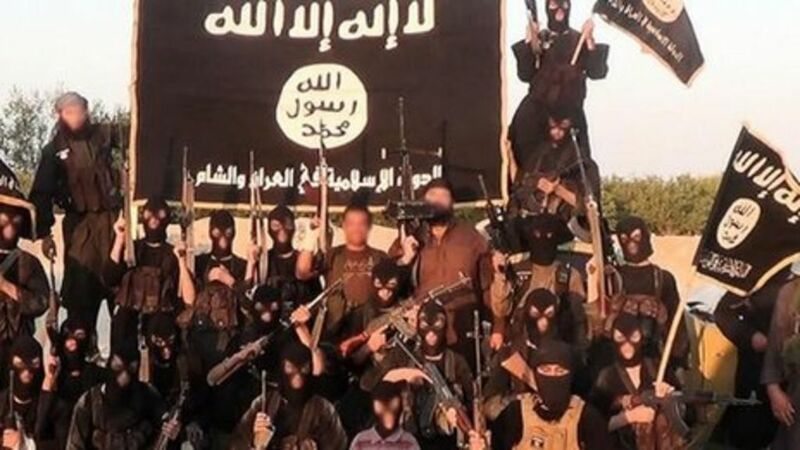 The U.S. has aided rebel groups in hopes that they will be able to defeat Assad while also attempting to resist ISIS. ​Upon taking office Donald Trump said that he wanted to stay out of Syria as much as possible, but that he looked at Assad as a potential ally in the U.S.’s efforts against ISIS. In early April 2017 there were deadly chemical gases released on Syrian civilians. At least 70 innocent people, including children, were killed. Many around the world, including the U.S., believe that the chemical weapons came from Syrian military planes that were controlled by Assad. This would mean that Assad intentionally used illegal chemical weapons on his own people. The Russian and Syrian governments both claim that the chemical weapons were owned by terrorists. The idea of Assad using chemical weapons on innocent people caused Trump to authorize a U.S. Naval ship to launch dozens of Tomahawk missiles on the airbase where the Syrian planes from the chemical attack originated. Above is a video that summarizes the Syrian civil war leading all the way up to the U.S. attack on the airbase. It goes more in depth on the complexities of alliances in Syria. Many people around the U.S. and world are unsure where this attack will lead. Especially since Assad has powerful allies like Russia. However, the scenario and negative potential reminds me of a major event that led the U.S. into the Vietnam War called the Gulf of Tonkin Incident. 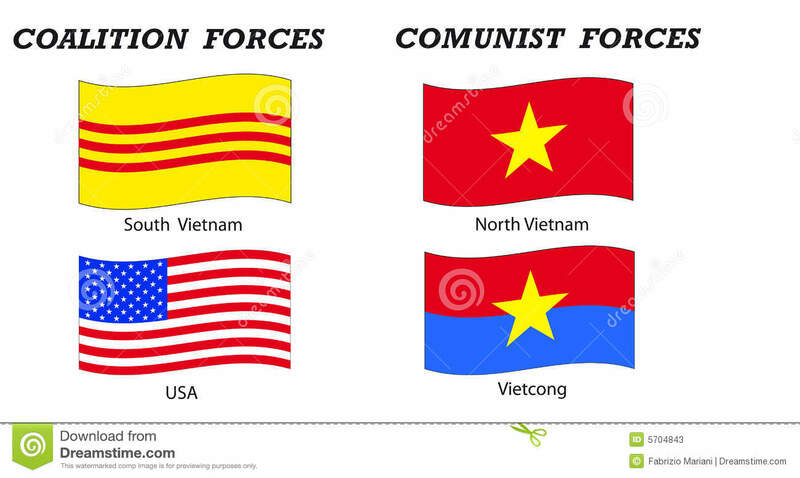 ​Around the start of the Cold War Vietnam had been divided between the north and south. 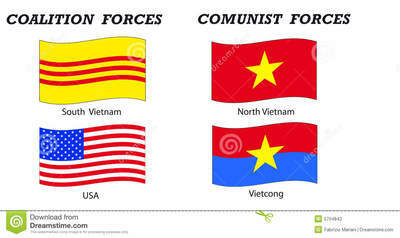 North Vietnam was led by Ho Chi Minh and supported by the Soviet Union since they used a communist form of government. 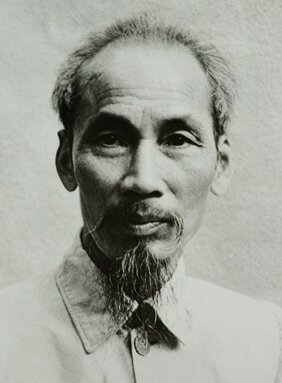 Ho Chi Minh hoped to reunite Vietnam under a more democratic form of government. 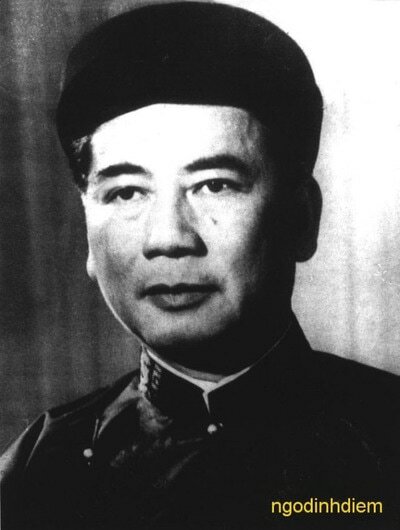 South Vietnam was led by Ngo Dinh Diem and supported by the U.S. since they were attempting to keep communism in North Vietnam from spreading to the southern half of Vietnam. ​In 1964 the USS Maddox was in the Gulf of Tonkin to the east of Vietnam. The Maddox saw what appeared to be torpedoes in the water on the sonar which had been fired on them from North Vietnam. However, the crew on the Maddox was not 100% sure. They knew that sonar would often malfunction during thunderstorms and make it look like their were false torpedoes in the water. The sonar men were unsure if they had actually been fired on by North Vietnam or just misinterpreted malfunctioning sonar. ​The U.S. military went back and forth all day trying to figure out if they had been attacked. They would report being attacked only to reverse their stance minutes later. In the end the Maddox determined that they had been attacked. With the final conclusion of a North Vietnamese attack on the Maddox, President Lyndon B. Johnson (LBJ) chose to conduct bombing raids on North Vietnam. ​LBJ thought that the U.S. military presence in Vietnam may need to be escalated, but he did not want to move any further without consent from Congress. 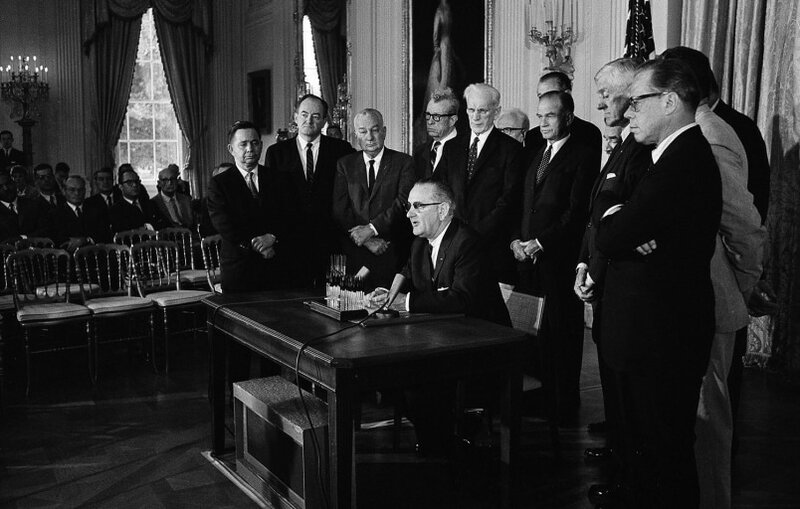 They approved the Tonkin Gulf Resolution that allowed LBJ to take any measures he thought necessary to retaliate and promote security. This is what allowed the U.S. to enter the Vietnam War without an official declaration of war from Congress. It was later determined that the Maddox had been wrong about being attacked by North Vietnam in the Golf of Tonkin. This means that the U.S. jumped the gun on our involvement in Vietnam. It resulted in the deaths of many American soldiers, Vietnamese soldiers, and Vietnamese civilians. It also caused birth defects from the use of strategic chemicals like Agent Orange, veterans to return home with post traumatic stress disorder (PTSD), and more. Above is a clip from a documentary called The Fog Of War about the Gulf of Tonkin. It will show Robert McNamara who was Secretary of Defense during the attack explaining what happened and how it led to U.S. involvement in the Vietnam War. The U.S. could have jumped the gun with Syria like it did with North Vietnam and it could have similar effects. Russia is already condemning the U.S. attack on Syria’s airbase. 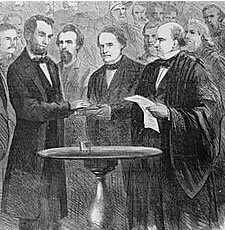 I hope that the U.S. does not get hastily drawn into another civil war where we are on one side while we are fighting against a side aided by Russia or Soviet Union. I do not pretend to think that the decisions of what the U.S. should have done in response to the Syrian chemical attack or Gulf of Tonkin attack were easy at the time. Nor do I pretend that I have all the inside intel that the presidents had regarding the situations. However, I do know that history shows that the U.S. jumped the gun with the decision to attack North Vietnam and the decision to attack Syria was also made in a short period of time following the chemical weapons attack. I do think that the U.S. needed to do something in response to the chemical gas attacks. This kind of crime against humanity should not be tolerated in the world. I was glad to hear that the White House made some kind of contact with Russia’s government before making the attack on Russia’s ally instead of just attacking. 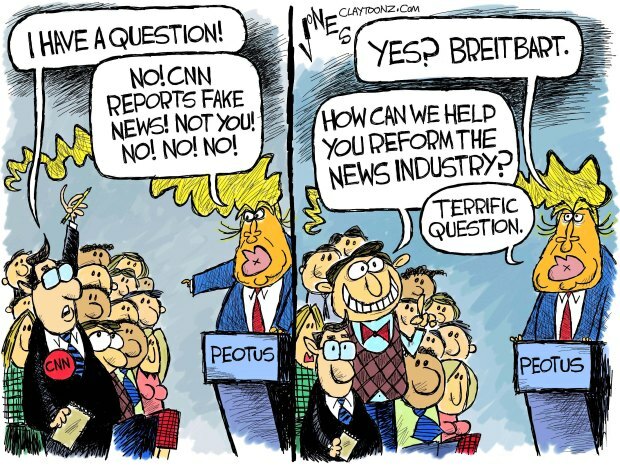 It gives less of a "shoot first and ask questions later" idea on the whole situation. I wish that the U.S. would have worked more with the United Nations to do some kind of combined effort to deal with the Syrian chemical attack. Deciding to do a direct military attack on our own furthers the idea that we think of ourselves as a world police force. A strategy done jointly with the UN would give more time for any extra information about the chemical attacks to come to light, shown that we are willing to work diplomatically with the rest of the world, not promoted our “world police” image, and deviated some of the overall cost of the attack (if that was the decided course of action by the UN) to other nations instead of just ourselves. As always, I encourage any comments (in favor or contrary) to my own or questions. Thank you! Recently Donald Trump announced his plans to increase United States military spending by $54 billion by cutting funds to other nonmilitary programs like those relating to education, poverty, science, and the environment. This would be in addition to about $600 billion that the U.S. already chooses to invest in our military. The way I see it, there can be only two possible goals for investing in a country’s military forces. It would have to be an effort to use that strong military to attack/invade other countries or to make sure that the country is prepared to defend itself for the possibility of other countries attacking their home or allies. I would hope that our current administration is not planning to go on the offensive against another part of the world, so that leaves the defensive purpose. If we believed that our country may be in jeopardy of being attacked by other nations, upping our defense spending to be better prepared would be understandable. However, the U.S. is already outspending more than six of the next top military spenders in the world. A good amount of those next countries are also our allies including the United Kingdom, France, and more. ​This would make it seem like our military is already well prepared for any kind of attack from other countries. The only way that an alliance attacking the U.S. could have a combined military with a close budget to that of ours’ would be if Russia, China, Saudi Arabia, India, Japan, France, the United Kingdom, and others all decided to join forces and assault the United States. This would also require that about half of these countries would have to abandon the ties that they currently have with the U.S. in favor of attacking us. This scenario seems unlikely. There is the possibility too that maybe other militaries are actually stronger than ours’ even though they invest maybe 1/5 the money that we do into their defense programs. In this case, I think that maybe making our military more efficient could be a better first step to bettering our defenses. Anyway, my difference in political philosophy aside, this proposed military buildup still throws up a historical red flag for me. It makes me think of one of the text book causes of World War I. Militarism. 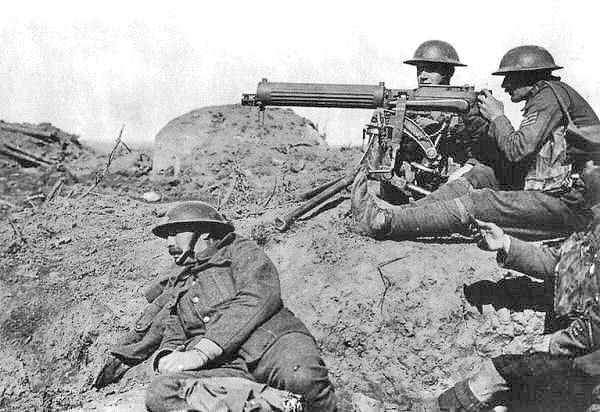 Leading up to the outbreak of World War I, history accredits four main causes to the start of this massive conflict: imperialism, militarism, alliances, and nationalism. Each one gets set up like a domino and plays a role in the chain of events that begin The Great War. Years before WWI began, European countries were easily the most powerful in the world and many of them were asserting their dominance around the globe. Countries like Great Britain, Germany, France, Spain, and more sought to create vast empires around the world. They set up colonies and established influence in Asia, the Americas, and Africa. Their conquests granted them things like natural resources, naval ports, people to trade with, and more. All of these added to the wealth and prestige of the European empires. As the various nations scrambled as fast as possible to get their slice of the world, they began to view themselves more and more as rivals. Above is a political cartoon that came out of Europe. 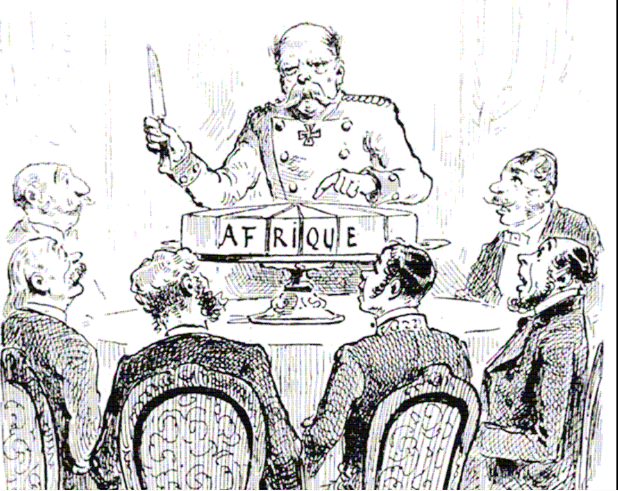 It depicts Africa as a cake that is being divided up by the men around the table who each represent one of the dominant European empires of the time. Germany, with the strongest military of the time is drawn as the leader. ​This struggle to obtain a larger portion than the other countries rooted these mentalities and made it easy for them to later make the jump from rivals to enemies. This is where the first domino of imperialism that causes WWI comes in and how it will eventually lead to a large conflict. With the rivalries between Europe growing stronger and stronger and their empires growing larger and larger, most of the countries saw a need to increase their armed forces. Germany especially invested large amounts of resources into an army that could better protect their colonies from native attacks, attacks from other European empires, as well as conquering other colonies. 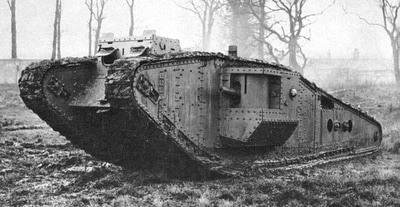 They also began to invest in the large amount of new war technologies that will later devastate in WWI. This included new weapons like machine guns, poisonous gas, air planes, tanks, and more. The large investments from these imperial countries combined with the wealth of new warfare technology meant that these world powers were now sitting on the strongest military forces that their nation and the planet had ever seen. Most of these powerful military forces had been slightly tested while they attempted to conquer colonies in Africa and other less developed areas, but nothing close to their full potential. The easiest way to describe this is that countries like Germany had “itchy trigger fingers”. They had powerful weapons that they were eager to try out, and the only way that could really happen is to go against another strong country like their rivals currently possessed. This is how the next WWI domino, militarism, slid into place. ​As the militaries around Europe grew larger and the rivalry mentality grew more intense, some of the countries looked to further protect themselves with military alliances. Germany, Austria-Hungary, and Italy formed the Triple Alliance. Each of the three nations publicly swore that if one of the members were attacked, the other two would come to their aid. They hoped that this would deter any outside country from attacking one of the members unless they wanted to take on the full force of the Triple Alliance combined. Other European countries soon reacted by forming their own military alliance called the Triple Entente. 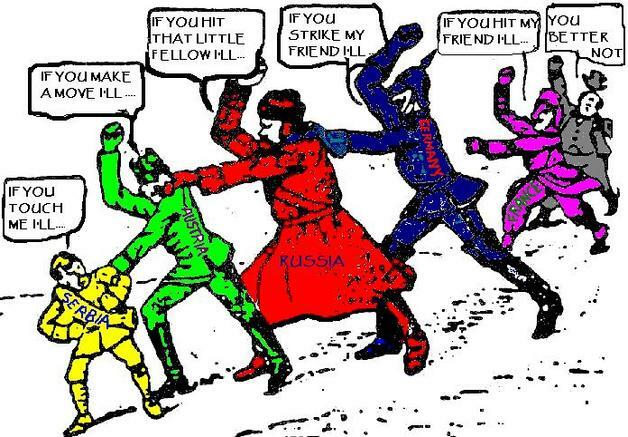 Great Britain, France, and Russia all made the same promise; that they would aid any one of their members that was attacked. Above map shows the alliances prior to World War I. 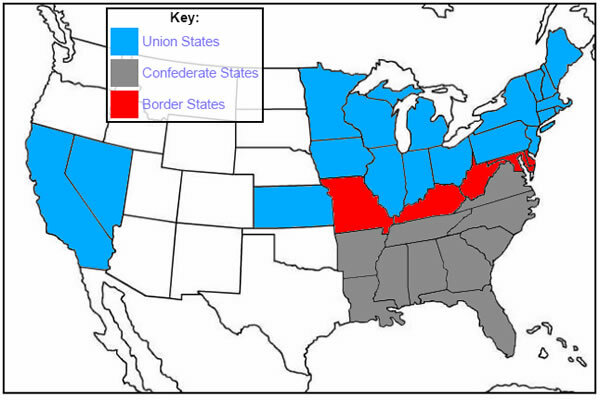 The Triple Alliance is shown in red while the Triple Entente is shown in grey. While they were intended for defense, these alliances created the possibility that if one member from either alliance got into a conflict the major world powers could soon be dragged in with their strong military forces. The alliances domino was now set. The final domino to set up is nationalism and it is often the most difficult to explain. Nationalism is an extreme version of patriotism. This is where people value the needs and superiority of their country and/or people very highly above those from other countries. Just before the start of WWI, nationalism was high in Europe. Most believed that their country was invincible. Their armies had recently seen many easy victories over tribes in Africa and Asia. There was also the belief that their countries were justified in these conquests. Many were adhering to the popular idea of Social Darwinism. It said that strong, technologically advanced countries were obviously destined to control smaller, more primitive peoples. Some went as far as saying that they had a responsibility to bring civilization to these undeveloped people. Anyway, the people in Europe had the mentality that their armies and country were unbeatable and just. 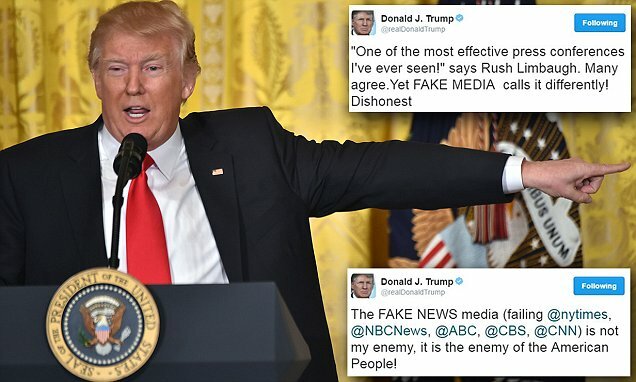 This combined with leaders and journalists that demonized other peoples and portrayed them as deceitful, aggressive, and attempting to undermine their great country. This left people even more charged and quick to assume the worst in other nations and/or people. The forth domino, nationalism, was now in place. ​With all four of these factors playing off each other and each domino barely remaining balanced, it would only take a small act to send everything toppling over. That event came in the form of a political assassination. Franz Ferdinand was Archduke of Austria-Hungary and next in line to rule over the empire. Austria-Hungary had control of much of the Balkan region of southern Europe, including Bosnia. 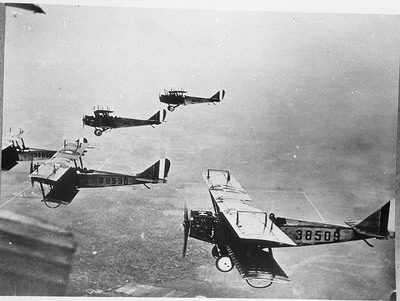 Ferdinand was scheduled to visit Bosnia’s capital of Sarajevo. 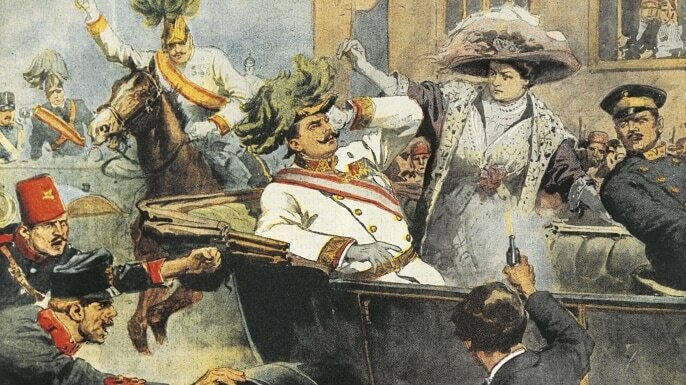 A nationalist group from Serbia called the Black Hand wanted to see many of the Balkan countries receive independence from Austria-Hungary, and they thought assassinating the Archduke would send a strong message to help their goal. ​After Franz Ferdinand was killed, the dominos quickly began to fall. Austria-Hungary attempted to punish the entire country of Serbia for the actions of the Black Hand. Serbia reached out to a country to which they had close ties for help: Russia. Austria-Hungary declared war on Serbia, Russia declared war on Austria-Hungary, Germany declared war on Russia and France, and France declared war on Austria-Hungary and Germany. Great Britain later honored the Triple Entente and joined France and Russia on the Allied Powers. 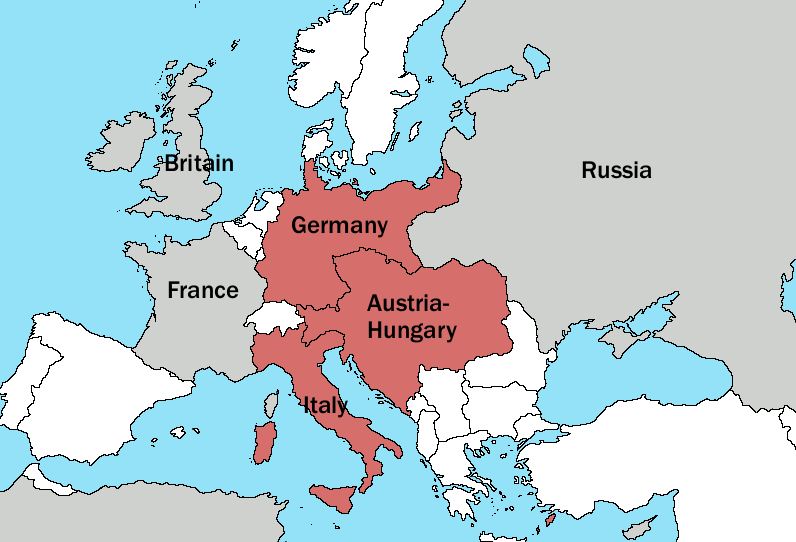 Italy never actually joined Germany and Austria-Hungary. ​These same factors can be seen in our world today. I have already mentioned the militarism displayed in Trump’s plan to increase the military budget by $56 billion. With us already possessing the most well-funded military throughout the globe then adding this extra cash, the United States could develop that “itchy trigger finger” that plagued much of Europe prior to WWI. Germany certainly had an impressive and well-funded army at their disposal and most historians would likely agree that they were the most eager to unleash its power. 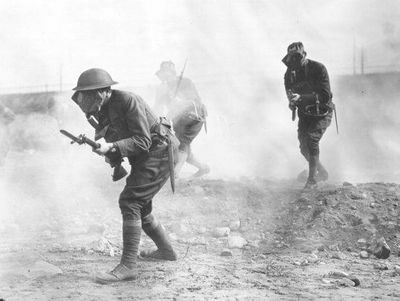 In today’s scenario, the U.S. may take on the role of WWI’s Germany with a large military and itchy trigger finger. Nationalism in today’s United States can be pretty clearly seen I think and it has some pretty close parallels to those around WWI. 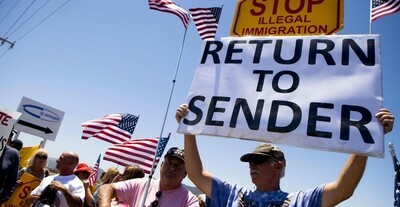 It is no doubt that many in the U.S. are patriotic, and there is nothing wrong with that. It does seem like there are plenty that go too extreme into nationalism though when they only value their own country and not those outside the U.S. Earlier this year in my U.S. Government course, my class was discussing something that I cannot recall but at some point a student even directly said something very nationalistic. I challenged him by asking something like, “What about people in other countries?” He replied by directly saying that he did not care. I was floored by this because I had never heard anyone so directly say that they did not care about the lives of other people. This student of mine, Trump, and many others have shown that they believe or promote ideas like those of nationalism. The large push now to keep Hispanic and Muslim immigrants from entering the country screams WWI nationalism. 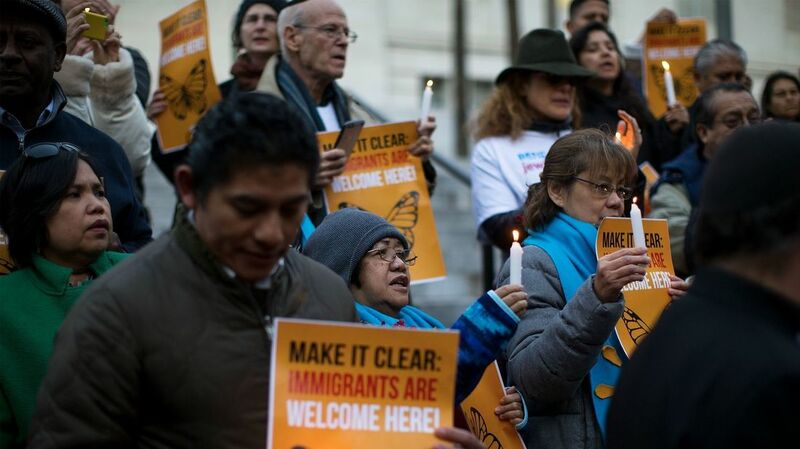 These immigrants have been labeled and viewed as risks and dangerous whether they are being accused of being drug dealers, rapists, terrorists, or just plain “bad hombres”. 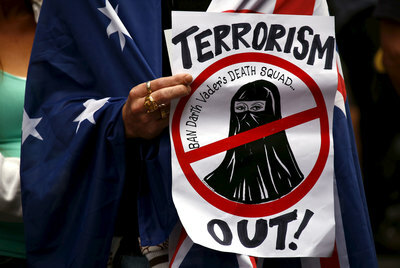 Either way, this promotes that aspect of people from outside the country trying to undermine the great homeland. We too have the aspect of U.S. nationalism that says our country is invincible like the European countries did before WWI. Many Americans have proudly stated at some point in my history class that the U.S. has never lost a war only to rethink that idea when they actually learn about the goals and outcomes of Vietnam. Maybe these students’ invincible, nationalistic mentality have been fact checked, but how many others have likely maintained it? 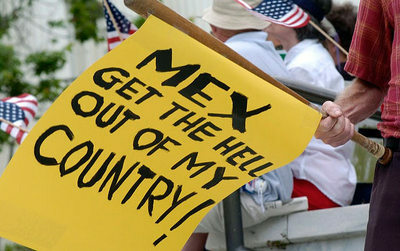 ​By the way, the U.S. is not alone in this nationalism. Britain leaving the European Union (a.k.a. Brexit) is a sign of nationalism as well, and Italy also had a strong nationalistic candidate running for election recently. I am unsure how that Italy election turned out. I apologize for that. But it does show that nationalistic ideas are a bit on the rise in the industrialized world. 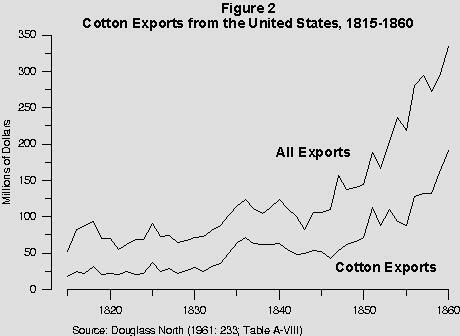 Before WWI, their aspect of imperialism came from different countries competing for colonies around the world for natural resources and trade. There is still an aspect of imperialism this in today’s world, but not so much with colonies. Today’s imperialism seems to more be about businesses and corporations in my eyes. The 2016 presidential campaign and others often brought up the concern over businesses, factories, and other things choosing to leave the U.S. and move to other countries for better profits. This could just as easily give the world a rivalry mentality against each other today like colonies did before WWI. Trump has already expressed plans to implement tariffs to help keep businesses from leaving and Mexican citizens have counterattacked through business with their #AdiosStarbucks campaign where Mexican citizens boycotted U.S. owned corporations that had major exports to Mexico. These could be early signs of an imperialistic rivalry brewing between the U.S. and other parts of the world. Paralleling the alliance aspect of WWI causes to today does not take as much explaining I think. It is well known that the U.S. has long standing alliances with other countries and it is likely that we would come to their aid as we have done before. Do not misunderstand me, I agree that the U.S. should help our allied countries when they need it as I would hope that they would help us. However, I hope that the other aspects of militarism, nationalism, and rivalry from imperialism will not cause our country to jump into a conflict too quickly as we have been known to before. ​Overall, a $54 billion increase in military spending concerns me because it shows that the U.S. is making a militarism move. This could be a domino being put in place for a major conflict like it was for WWI. I am not delusional. I believe that American wars have been justified at times in our past. Our future may also have more justified wars. However, if/when the potential for war does arise, I hope that people are able to look past militarism, nationalism, and imperialism and not let these dominoes bring us crashing down to an unnecessary war.